It feels like we’ve been in Morocco for weeks now because we have done and seen so much, though we’re only on the third day of the tour. 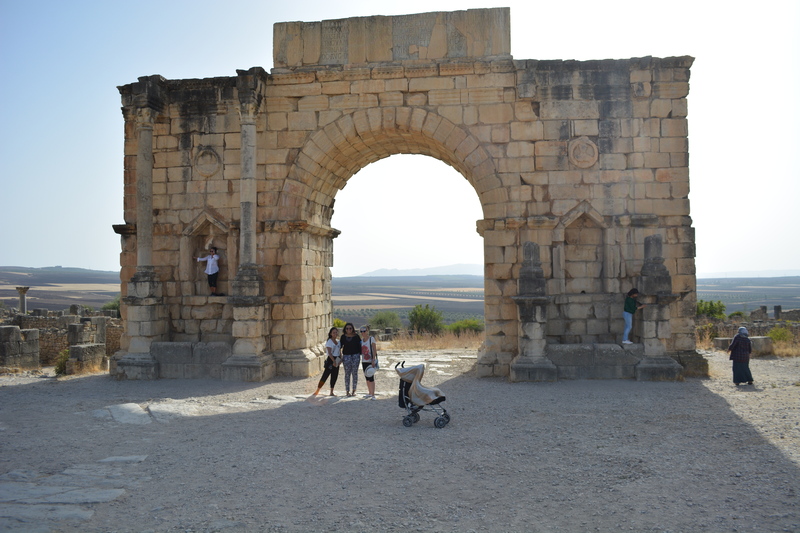 Yesterday morning we ate breakfast at the hotel and set out for Meknes. Our bus is a small but comfortable white van with just enough seats for our tour guide, driver and us. We stuffed our luggage in the back and grabbed our seats in the cabin. After my second day wandering around Casablanca, I grew to really like the city, but I was excited to leave and head off to new parts of the country. I quickly learned that even the drives are a memorable part of the trip. 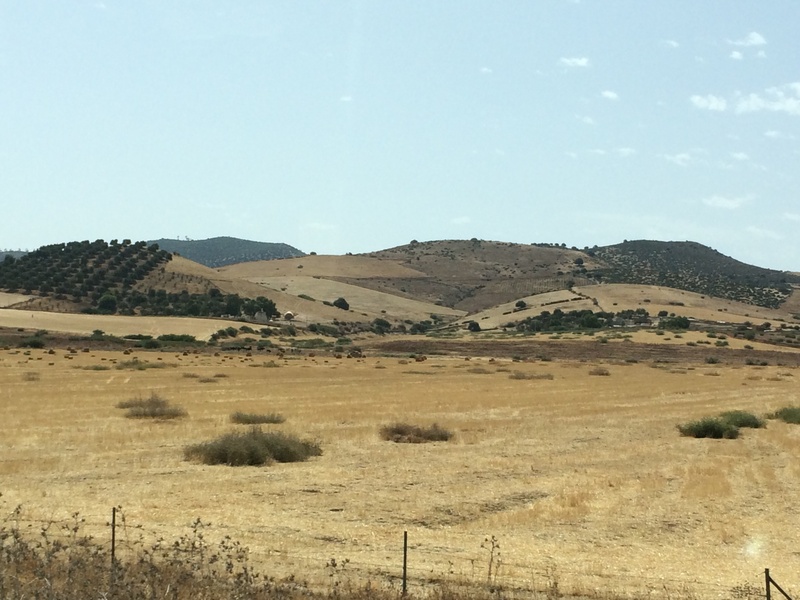 As we drove through the Moroccan countryside, we were exposed to a 360-degree view of rolling hills with peasant farms. The terrain in this region is very dry with sparse foliage, but the farmers seem to make do with that resources they have. The sheep and cows on the farms looked under-nourished since they don’t have much to eat, but there were still hoards of them scattered through the farms. All together, the farms and hills made for rustic yet ethereal scenery. Admiring the houses sitting on the siting on the hilltops, a man sitting next to me said, “Imagine waking up to this view every day. You’d feel like anything is possible.” I pondered that a while and though about how much I agreed. Open air and nothing but the world around you. What a powerful feeling. 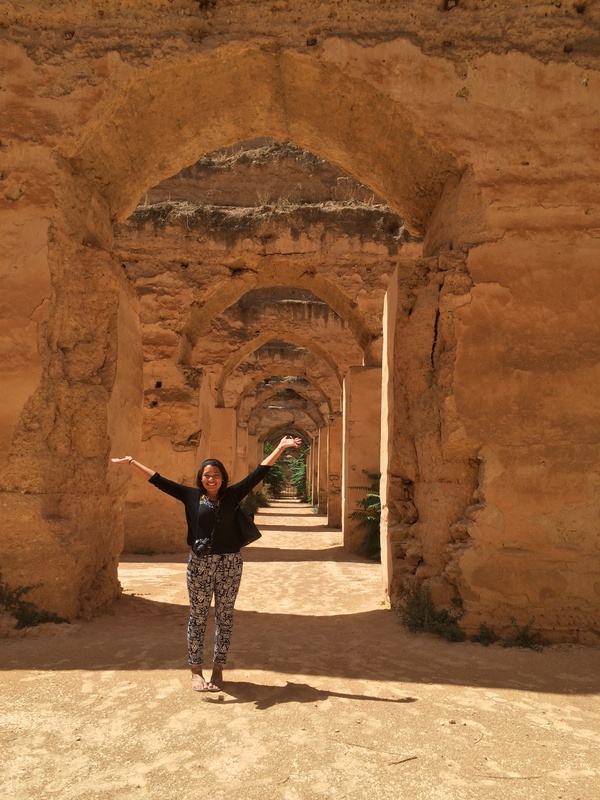 We rolled along for four hours until we hit our first stop — Meknes. 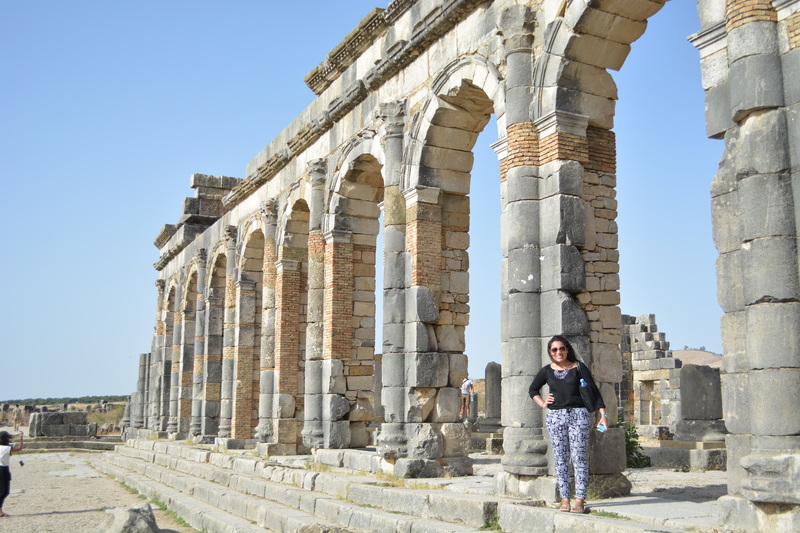 I learned that it was a city built by a medieval sultan who wanted to create a palace and surrounding town that would be the Versailles of Morocco. He succeeded. Our last stop before lunch was in a shop where the workers showed us how Moroccan table clothes are woven. As early as in school, children are taught to weave designs into cloth to make sure the same design was visible on both sides. They had several designs in many colors, depending on table size and shape. I never knew how much went into crafting table cloths! We all bought of and rushed to lunch because we were starving. 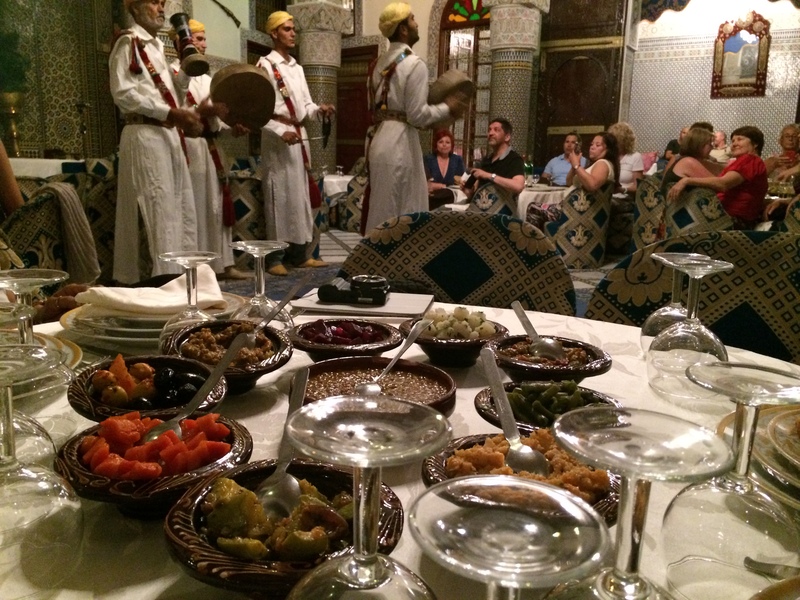 There are three main dishes here: couscous, skewers and tajines. Tajines are pots that look like the tin man’s hat from the Wizard of Oz and act like crockpots or small kettles to cook mixes of vegetables and meat. I’ve had one tajine dish so far, chicken with lemon and olives, and it was out of this world! In Meknes, however, I had an omelette (also popular here but not served in as many restaurants) because I filled up on free bread before the meal. Hehe whoops. 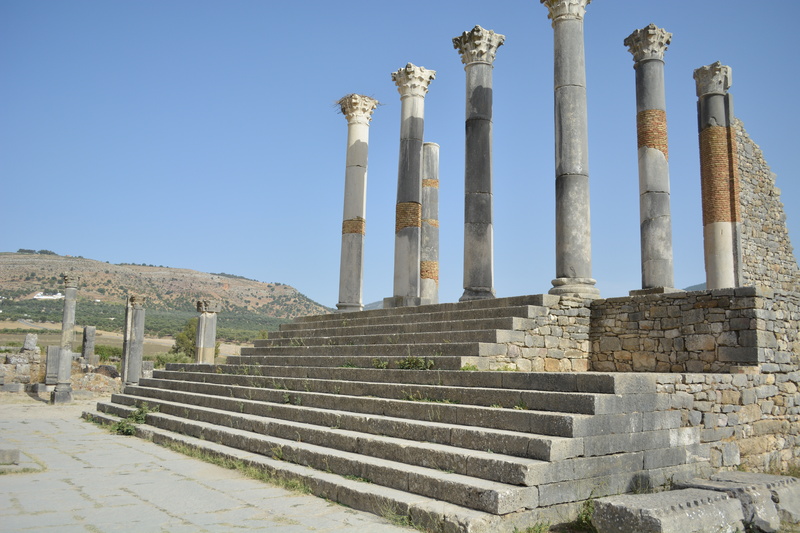 After lunch, we hit the road again and strolled along to Volubilis, a small town characterized by ancient Roman ruins — Volubilis itself being the Italian word for a type of flower. We got out of the van and were greeted by a tour guide who showed us around the grounds. 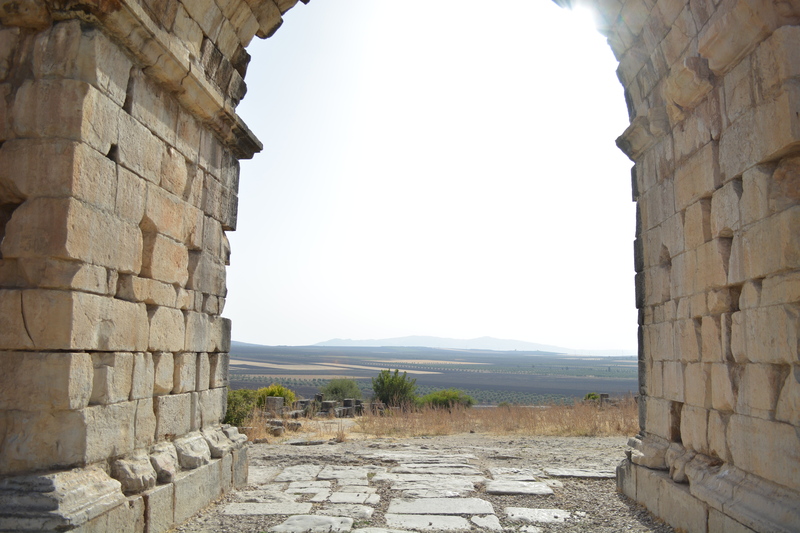 The area was vast and barren, with dry ground and stones everywhere and atop a hill that overlooked stretches of farmland. 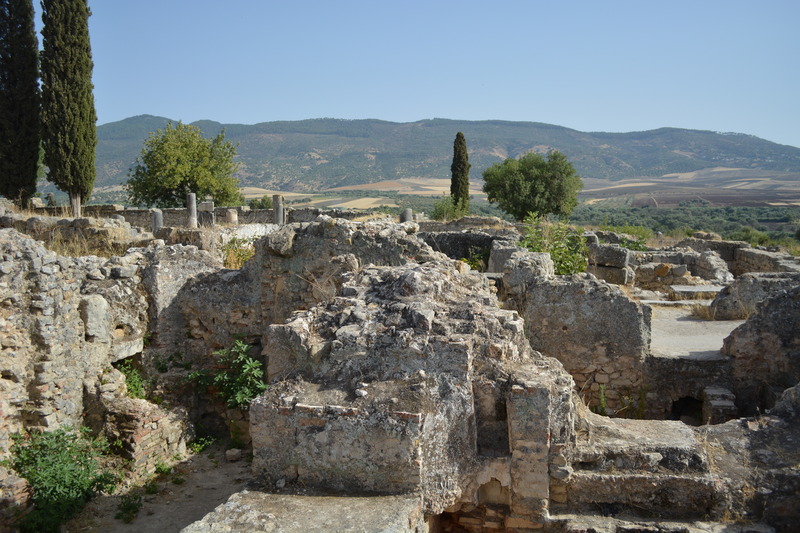 The guide showed us the remains of a Roman house that’s ruins outlined the structure’s foundation. 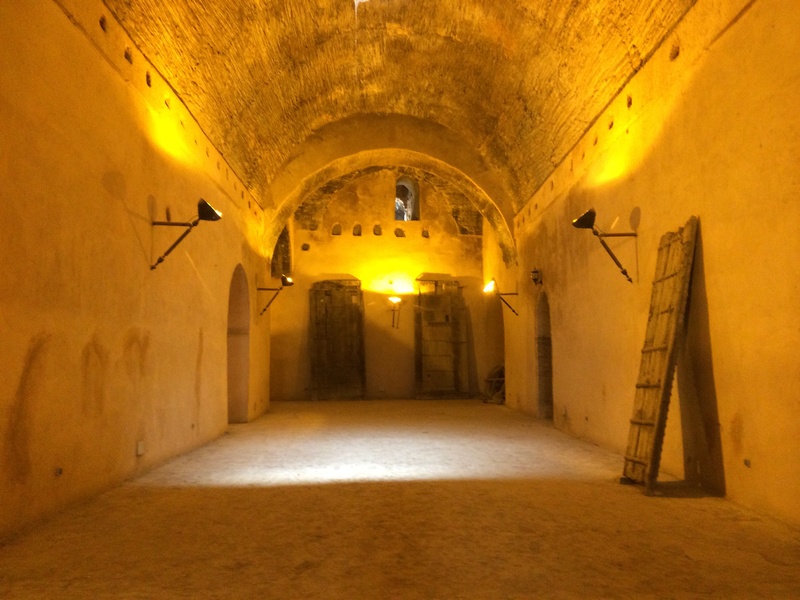 He explained what each of the rooms were, even where the Romans kept and fed their pet lions — which were rooms only slightly larger than my dog’s cage. Ha, just kidding, they were huge! We saw a few more features of the house, like where the baths once were and a set of stairs leading up to the entrance of some nonexistent room gated by tall columns. Again, this stop was an amazing opportunity for photos, so we took plenty, but soon became wary from the blazing sun and headed back to the van. 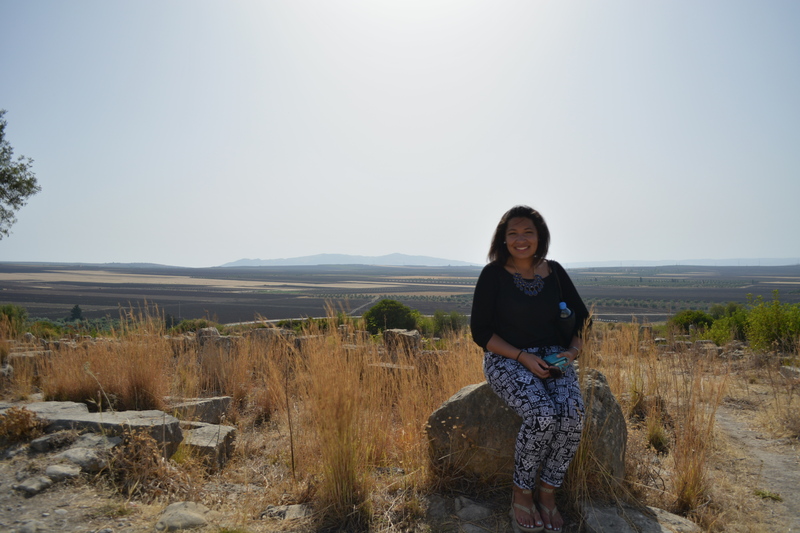 For the last leg of the day’s long road trip, we rolled along the countryside once more on our way to Fes. We arrived in the city about two hours later and drove straight to our hotel. 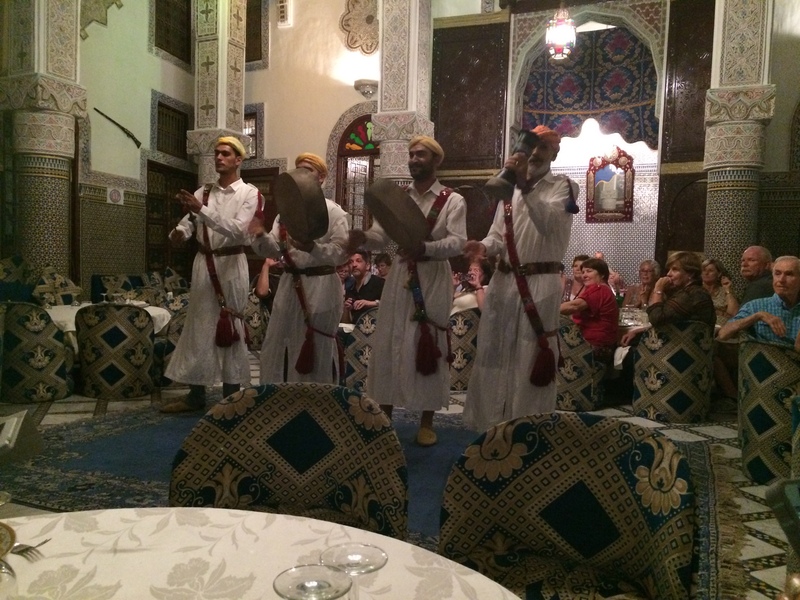 Even from our arrival, I could tell I was going to like Fes. 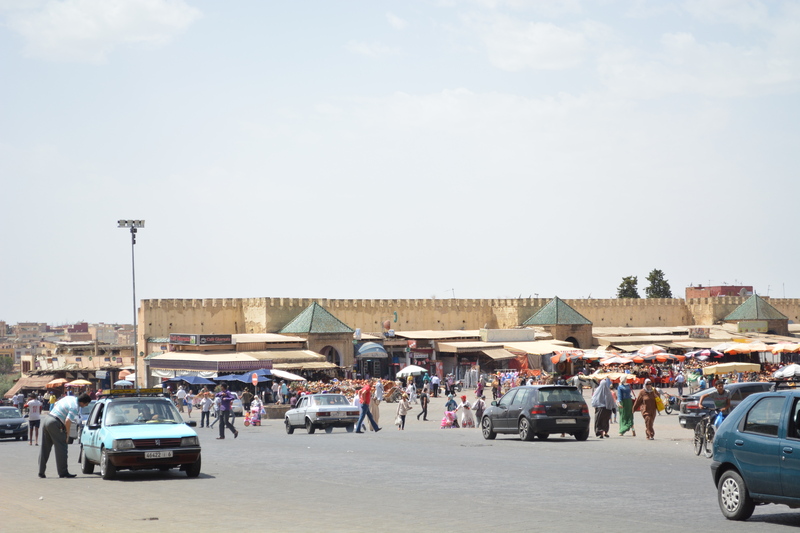 The city was as developed as Casablanca, meaning various modern buildings spattered with a few decrepit and vacant ones, but unlike Casablanca has cleaner roads,greener foliage and many fountains situated in the center of traffic circles. 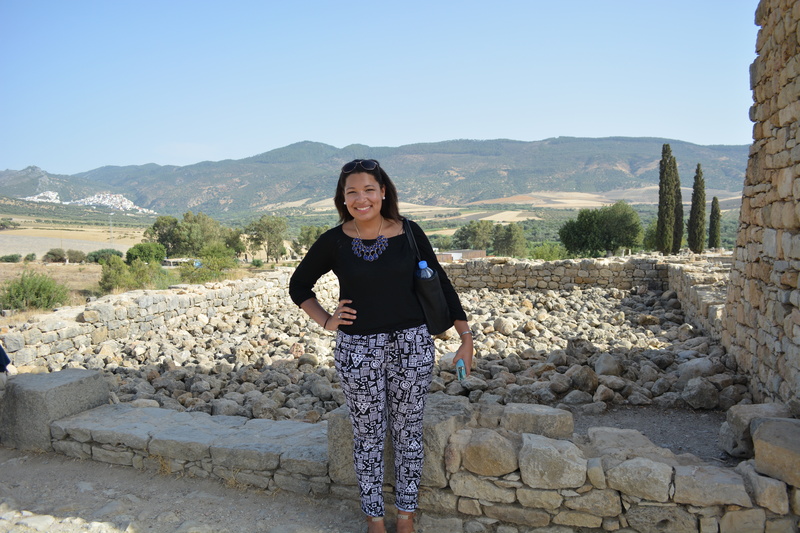 I learned that Fes is known to have the cleanest and one of the most plentiful supplies of water in Morocco. The city’s colors are even green and blue; green for the color of Islam and blue to symbolize fresh water. A few members of the hotel greeted us and helped carry luggage to our rooms (for a fee of course). The rooms were clean and simple, and small but comfortable for two people. We were going to a group dinner that night, so we had to quickly change and head back down to the lobby to meet our guide. 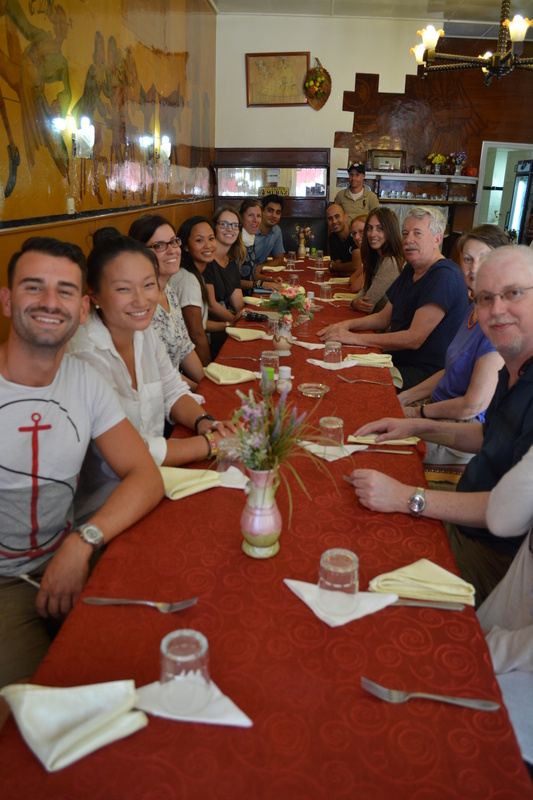 Once everyone was ready, we hopped on the bus and drove to an authentic Moroccan restaurant (and when I say authentic, I mean overly authentic and very clearly a place that caters only to tourists). Upon arrival, our ears were greeted with the sounds of loud singing and instruments. The restaurant was arranged like a courtyard, with tables lining the walls and an open space in the middle. While waiters served us several rounds of small dishes, we happily watched a series of performers dance, sing and plays songs. I was a fabulous night full of merriment, and got a few of us excited enough that when we went back to the hotel after dinner, we weren’t ready to sleep yet. 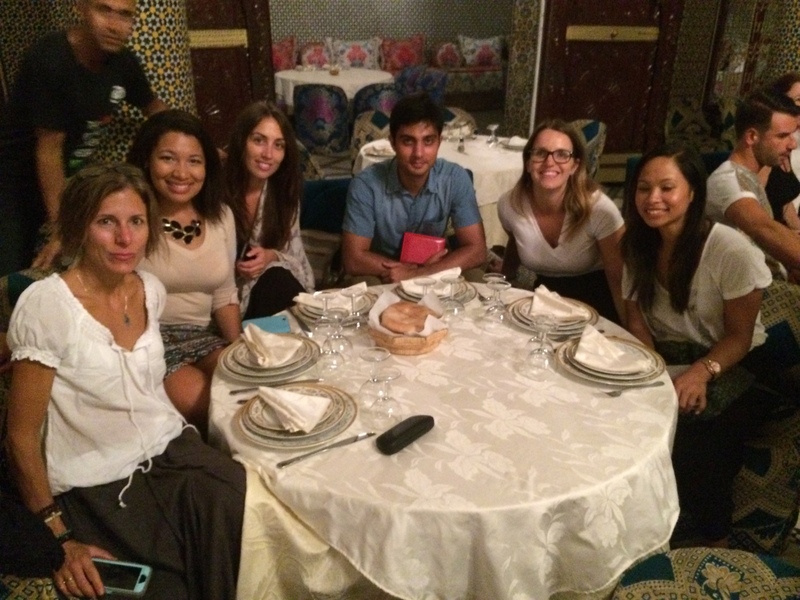 Six of us decided to go for a nighttime jaunt though Fes to see how the city looked in the absence of sun. Our path took a figure-eight form with our hotel at the center, since we didn’t want to stray far away from our safe spot. Fes as night was busier than we expected. Lots of locals were out on the streets, talking, laughing and, in two cases, cleaning cars. The six of us relieved a few honks from locals who drove past and could tell we were foreign, but we embraced it and even smiled back at a few strangers. But soon our adventure came to an end as we got tired and we settled back into our hotel rooms. It had been a long day full of lots of sights and information, so we were all ready for a good night’s sleep. I love Morocco. It is so enjoyable. I could not visit Fez but the places I have gone to were beautiful and inspiring. Couldn’t agree more! Morocco is one of the most naturally beautiful countries I’ve visited. It really is an inspirational place. 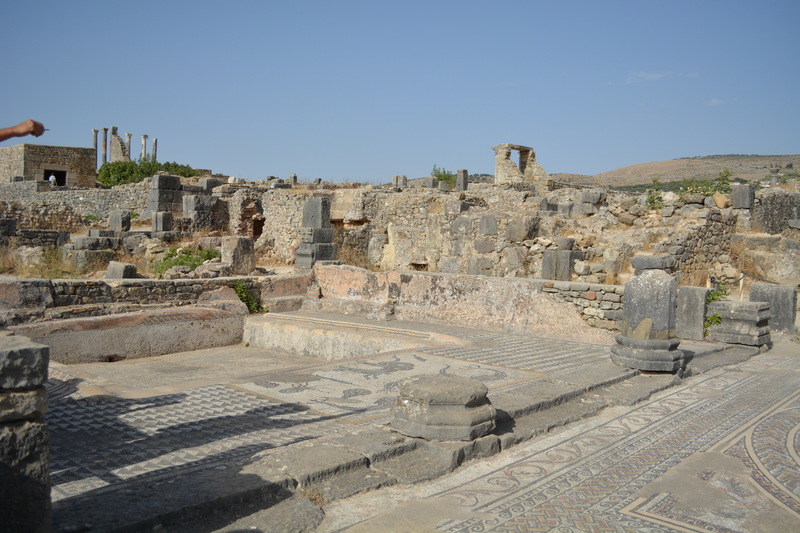 Sorry you couldn’t make it to Fes — I really enjoyed that city! Where did you go? 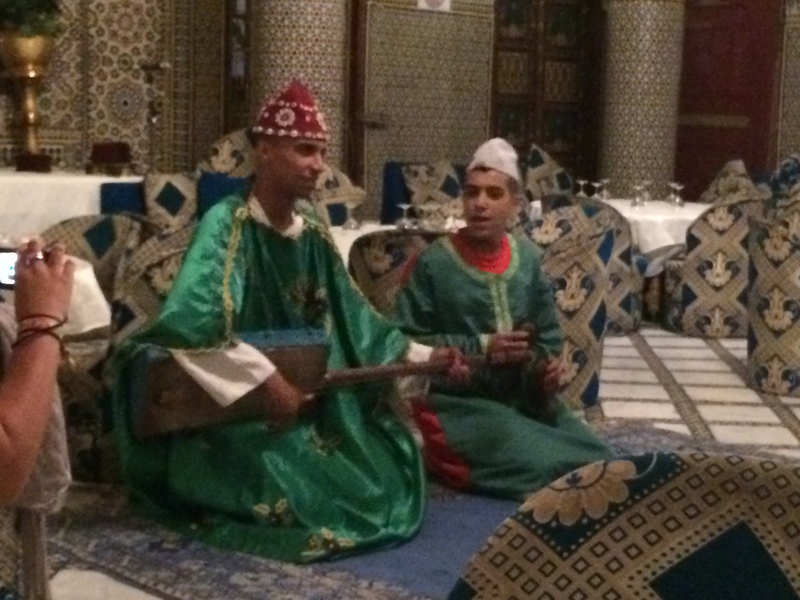 I did three cities: Marrakech of which I fell in love, rabat which impressed me a lot, and Casablanca which was not the ideal but OK for a night. Are you still there?